Karamba Sports is one of the newest sportsbooks online today, with the company owned by ASG Technologies, as well as their headquarters being based in Malta. Karamba Sports hold a full gambling license from both the Malta Gaming Authority and UK Gambling Commission, helping them to attract customers from across Europe. Despite being more well known for their casino offerings, their sportsbook is now gaining a lot of recognition thanks to its range of markets and customer service features. Our review will take a detailed look at their sportsbook’s entire operation, however let’s first take a closer look at Karamba Sports’ history and achievements to date. 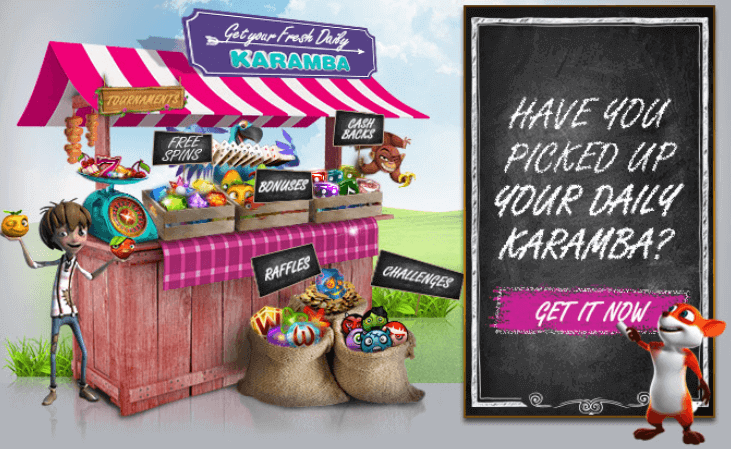 Karamba was initially established back in 2005, initially operating as an online casino. However, their sportsbook is relatively new to the industry, with their betting platform having already gained a good reputation as a bookmaker who are perfect for all forms of customer. Despite not having formed any major sponsorship deals within the industry, their sportsbook has already attracted the interest of thousands of customers. With two gambling licenses, Karamba Sports are able to cater for betting punters located in a wide range of locations. Our Karamba Sports review will provide readers with a much clearer understanding of their operation, with everything from their range of promotions and sports markets to customer service and additional features discussed. However, let’s first take a look at the pros and cons of Karamba Sports. Our Karamba Sports review found that the bookmaker currently offers over 25 different sports markets, with traditionally popular betting events such as football and tennis joined by more diverse disciplines, including futsal, chess and Aussie Rules. A lack of any horse racing markets will certainly be disappointing for some, however Karamba Sports do cater customers looking for special markets, such as the royal wedding or general elections. In our review, we found the following sports markets available for wagering upon Football, Basketball, Tennis, Aussie Rules, Badminton, Baseball, Boxing, Chess and many more. For a sportsbook that is relatively new to ther market, Karamba Sports‘ odds particularly pleasing, especialy when it comes to some of their more diverse markets, such as ice hockey and volleyball. Odds are certainly one of the most important factors to consider when looking for a new betting platform, with Karamba offering some of the best online today. Although they vary from sport to sport, the levels are consistently good, sitting at over 90%, which is on a par with some big names within the industry. Football customers at Karamba Sports can look forward to an odds level of between 90-93%, while markets such as darts and golf are even better, offered at around 93-95%. The usability of a betting platform has become increasingly important to potential customers, with Karamba Sports having clearly put hard work into ensuring that their sportsbook is easy to use. Despite not being the most attractive platform around, with a grey and green colour scheme dominating throughout, customers can easily move between markets and pages. 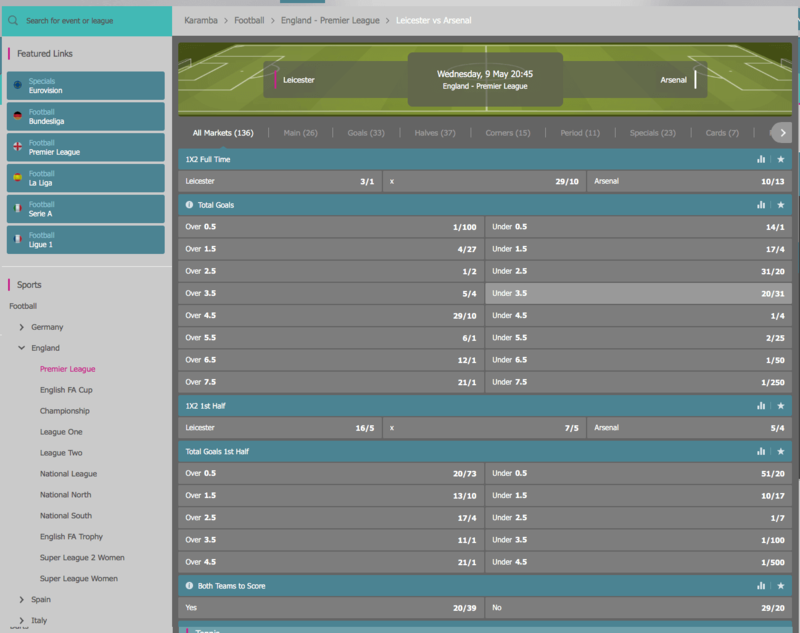 All sports markets are listed down the left-hand side of the page, while users can move between pre-match and in-play events thanks to cleverly placed tabs. An automatically updated bet slip is displayed on the right-hand side of the page, while features such as cash out, customer service and their results page can be accessed at the top of the screen at all times. Customers can also choose to view odds in either a fractional or decimal style. As well as this, all ongoing promotions at the time are displayed using visually-pleasing imagery at the top of the page, meaning that customers should never miss out on utilising a generous offer. Elsewhere, the ‘Fast Markets’ feature allows customers to bet on whether they believe a specific event will happen within a certain timeframe, whether it be a goal scored in football or a break of serve in tennis. In terms of mobile betting customers, despite not having any form of app, Karanga Sports ensure that there is never any reason to miss out on a potentially lucrative bet. Customers can place bets using their device thanks to a mobile-friendly website, which offers all of the same features and services. The browser works well on both iOS and Android devices, with the speed of the platform making it a viable option for all. As well as providing a large number of sports markets, Karamba Sports coverage is also pleasing, with events of all kind from around the world available on their betting platform. As with many European sportsbooks, football plays a major role in their daily markets, with all major leagues and competitions on offer. As well as basic 1X2 markets, customers are able to bet on the number of goals scored, yellow cards and corners, along with a range of other markets. Elsewhere, sports such as tennis and basketball are also available in great detail at Karamba Sports, with the bookmaker having already taken great strides in this area of their operation. ATP and WTA tennis tour matches are covered on a daily basis, while action from the NBA and Euro Basket are also regularly found. 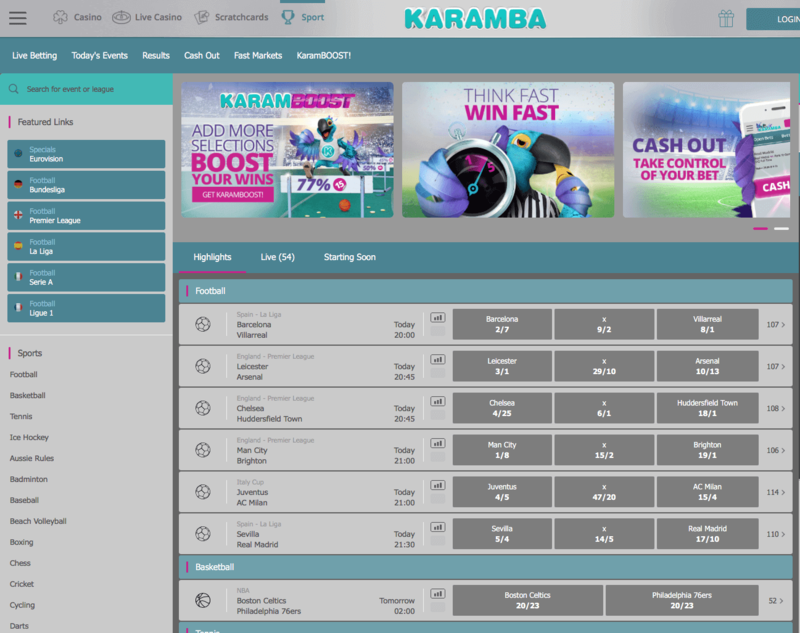 Live betting also plays a significant role in Karamba Sports’ offerings, with a dedicated in-play page making it easy for customers to view all available markets, as well as upcoming events. Again, sports such as football, tennis, cricket and basketball are among the most commonly found live betting markets on their site, with odds being updated on a regular basis, determined by events taking place in the specific encounter. Unfortunately, Karamba Sports do not currently offer any live-streaming options, however this perhaps comes as little surprise given their short time operating as a sportsbook. However, given the improvements that they have already made in other areas, this is certainly something that is likely to be available in the future. A lack of any loyalty scheme or points system comes as a disappointment, with customers enjoying nothing better than receiving a free bet or bonus funds as a result of their consistent wagering. This is another area in which Karamba Sports may look to make improvements in the future. When it comes to minimum stakes at Karamba Sport, customers can bet on their favourite sports teams and players with just £0.10, while daily winning limits sit at between £10,000-£50,000, depending on the market. As previously mentioned, Karamba Sports offer a good range of customer service features, meaning that all user needs are met in this area on the whole. Customers are able to communicate with friendly and knowledgeable support agents from 06:00 to 23:00, with such opening hours meaning that problems and issues are generally dealt with in an efficient manner. Telephone and email contact can be made, while a live-chat feature is the preferred choice for many punters, as a result of its ease of use and speed. Customers can expect to receive a reply to emails within just a matter of hours, while a FAQ page is on hand to answer some of the most commonly asked questions regarding their sportsbook operation. In order to take advantage of one of these customer service features, punters must click on the ‘Contact Us’ tab, located at the bottom of the screen on both desktop and mobile platforms. Despite being new to the industry, Karamba Sports have ensured that their sportsbook is 100% safe, as well as trustworthy. With full gambling licenses from top authorities in both Malta and the UK, Karamba Sports’ betting platforms are reliable too, with a SSL encryption, provided by the respected Secure Socket Layer, helping to ensure that all transactions are processed securely, along with all personal details being safe. As you will have found from reading our Karamba Sports review, their sportsbook comes with a large number of advantages, meaning that they are certain to continue to attract new customers. Despite a lack of live streaming and additional features, the bookmaker performs well when it comes to their welcome bonus, range of markets and usability. Fans of a variety of sports will be happy with the coverage found at Karamba Sports, with only a lack of horse racing coming as a disappointment. Elsewhere, customer service is taken extremely seriously on their betting platforms, with questions answered within just a matter of hours on most occasions. Meanwhile, despite not currently offering any betting app, mobile customers are unlikely to be disappointed by Karamba Sports’ website, which is both quick and easy to use using iOS and Android devices. The bookmaker also performs well when it comes to their minimum deposits and stakes, as well as their accumulator boost promotion, available to new and existing customers. Karamba’s sportsbook is a betting platform that should be considered by a wide range of customers when looking for a new bookmaker, despite their relative inexperience in the industry. The platform comes with a large number of positives, including its competitive odds, website usability, cash out feature and customer service options. Meanwhile, the areas in which they do currently falter are perhaps to be expected for a bookmaker of their size. Such negative factors include a lack of live-streaming options, poor withdrawal processing times and both horse racing and greyhound markets. 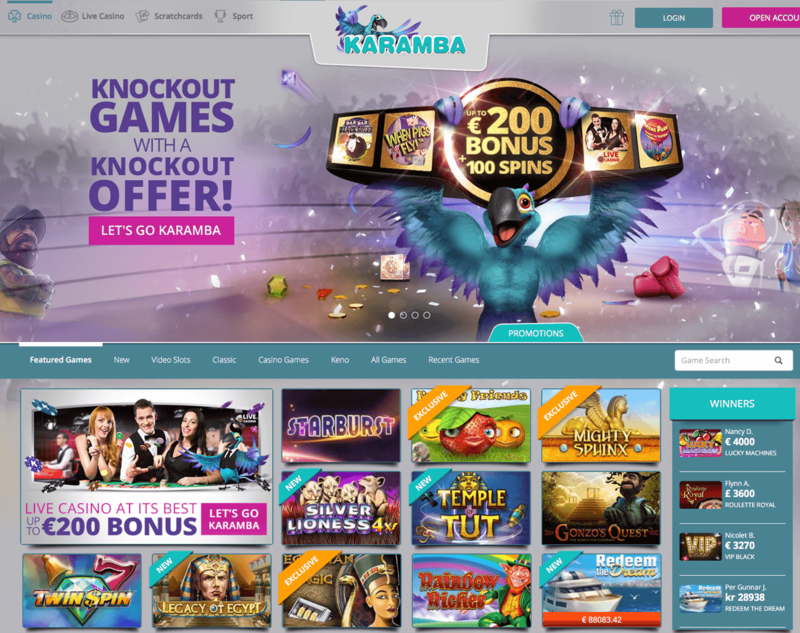 Given the success of their casino pages, it would come as little surprise should Karamba make improvements to their sportsbook in the near future, based on the feedback received from both new and potential customers.